Banduk Marika is the youngest daughter of Mawalan Marika, and sister of Wandjuk. Banduk Marika and her sisters are among the first Yolngu women to be encouraged by their male relatives to paint ancestral creation stories. 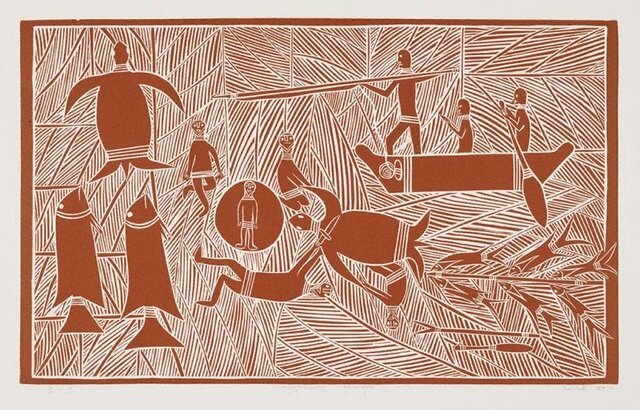 Marika's medium of choice, linoprint, enables her to depict the ancestral stories in a new way, while respecting the law. Carving the design into the lino blocks echoes the practice of precisely incising clan designs onto wooden objects such as ancestral figures, Macassan pipes and message sticks. Marika's print 'Miyapunuwuy Yarru Yan – Turtle hunting at Dhambaliya (Bremer Island)', 1987, illustrates key aspects of the story of two ancestral hunters who harpooned turtle and prepared them in the traditional way on Ruwakpuy Beach. Gakarrarr, the land seagull, was spearing fish nearby and caught wind of this. Sneaking up, he grabbed some meat and was in turn caught by the hunters and thrown onto the fire. 'Wawalak Wulay, Djan'kawu Creation', 1987, shows scenes from the Wawilak Sisters and Djan'kawu song cycles. Because she is a Rirratjingu woman, Marika is intimately associated with Yalangbara and other important clan land in the region. As a traditional landowner at Yirrkala, Marika has inherited responsibilities that have shaped her life. She was educated at Yirrkala and moved to Darwin in 1972. She later moved to Sydney in 1980 to pursue her career as an artist. In 1984 she was artist-in-residence at the Canberra School of Art, and in 1985 she was artist-in-residence at Flinders University, South Australia. In 1988, Marika returned to Yirrkala to be the manager of Buku-Larrngay Mulka Arts Centre and Museum. Marika combines her familial responsibilities with her activities as an artist and cultural activist. She has travelled as a delegate and speaker to many national and international conferences. In 1994, a Federal Court judgement awarded Marika (and seven other Aboriginal artists) damages against a company that illegally reproduced their work on carpets produced in Vietnam. Consequently, she featured in 'Copyrights', a documentary made in 1997 that explored Indigenous principles of copyright. Among Marika's many accomplishments have been appointments to the boards of the National Gallery of Australia, Canberra, and the Museums and Art Galleries of the Northern Territory, Darwin. She was also a member of the Aboriginal and Torres Strait Islander Arts Board of the Australia Council. In 2001, Marika was the recipient of the Aboriginal and Torres Strait Islander Arts Board's prestigious Red Ochre Award for lifetime achievement. Signed and dated l.r. corner, pencil "Banduk "87"".